William Rawson, born about 1894, was the son of William Rawson, a publican, and Ellen (nee Webster) of Old Westwood (Palmerston Street). John had younger siblings named Arthur, Ellen and Maud. In 1911 the family was living at Old Westwood and William, then aged 17, was employed as a labourer at the ironworks. 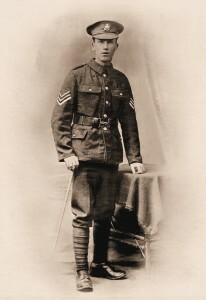 William enlisted at Nottingham, date unknown. He was killed in action on Sunday 3rd September 1916 during the attack at Beaumont-Hamel. A Free Press Newspaper report, dated 1917, states that ‘he had been missing for a long time past’. 31427 Pte. Thomas Burton, 17th Bn. 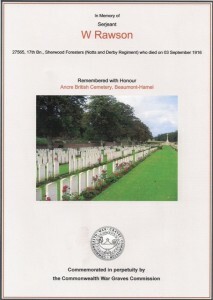 Sherwood Foresters, was also killed in action on the same day, during the same attack. The community lost three men on that day, the third being 978 Sgt. 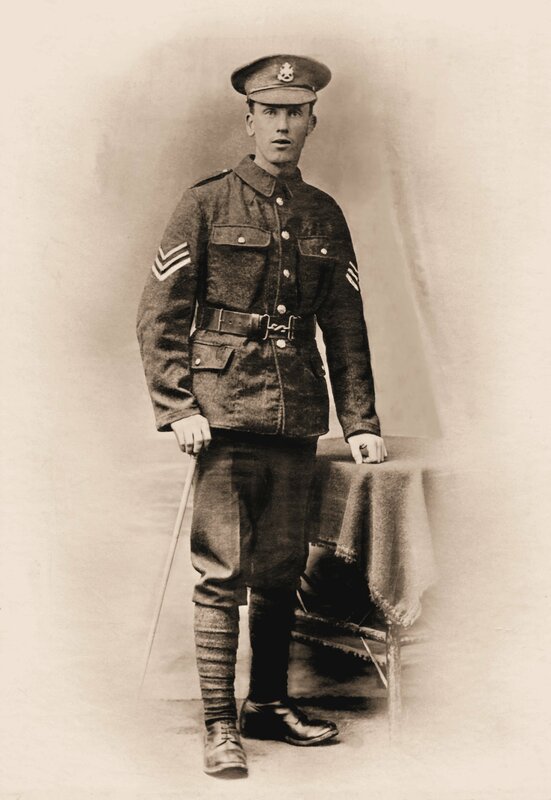 William Wood Gibbins of the Royal Munster Fusiliers. Sgt Rawson is buried at Ancre British Cemetery, Beaumont-Hamel, Somme. 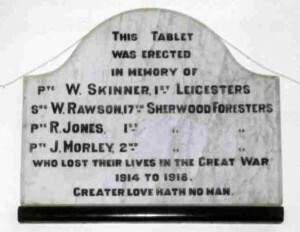 A memorial service was held on Sunday 5th August 1917 at St. Mary’s Church., Westwood. Sgt Rawson was awarded the British War and Victory Medals. Personal effects of £10 15s 4d were paid to his father in September 1917 and in October 1923 a war gratuity of £7 10s was sent to his mother Ellen. The village of Beaumont-Hamel was first attacked on 1st July 1916, without success. On the 3rd September 1916, a further attack was delivered between Hamel and Beaumont-Hamel. It was not until 13th and 14th November 1916, that Beaumont-Hamel was successfully captured. The majority of those buried in the cemetery died on 1st July, 3rd September or 13th November 1916. There are now 2,540 casualties of WW1 buried or commemorated at this cemetery, of which 1,335 are unidentified. Also on the Jacksdale War Memorial (served) is Pte. Arthur Rawson, 30546 17th Bn. Sherwood Foresters, thought to be William’s brother. The Absent Voters Roll of 1918 gives Arthur’s address as Old Westwood (Palmerston Street).